AAMS17 - Alloys for Additive Manufacturing Symposium. 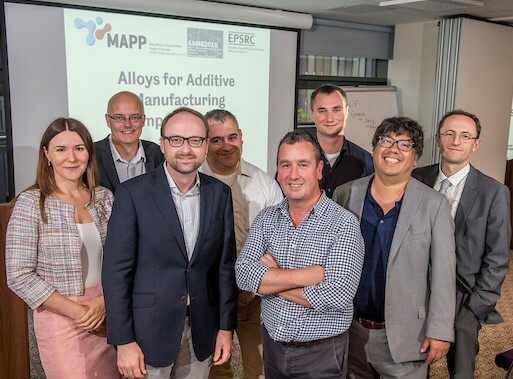 After last year’s well-received Alloys for Additive Manufacturing Workshop at the MPIE, the inaugural AAMS 2017 hosted by EMPA proved to be hugely successful as a showcase for top quality research into additive manufacturing of challenging materials. A wide variety of research topics were presented including microstructure simulation, process optimisation, residual stress and cracking phenomena and effects of post processing techniques. The conference was well attended, with representatives from both academic and industrial institutions including Oak Ridge National Laboratory, the Fraunhofer Institute for Laser Technology, the Department of Materials Science and Engineering University of Sheffield, the Madrid Institute for Advanced Studies of Materials and LPW Technology. The presentations were detailed and demonstrated the enthusiasm for advancing AM technologies within the academic community. A keynote presentation by Maria Teresa Perez-Prado discussed the opportunities available through a new lab-scale atomiser for powder design, while Jan van Humbeeck illustrated the scope for extracting additional benefits from AM in his presentation on the potential of 4D printing. The event provided an ideal platform for networking and discussion of shared interests, benefiting all who attended. Delegates were also treated to a demonstration of Swiss chocolate making during an interesting (and tasty) poster session. I look forward to next year’s symposium which is to be hosted here in Sheffield on the 3rd and 4th September 2018 at INOX Sheffield.